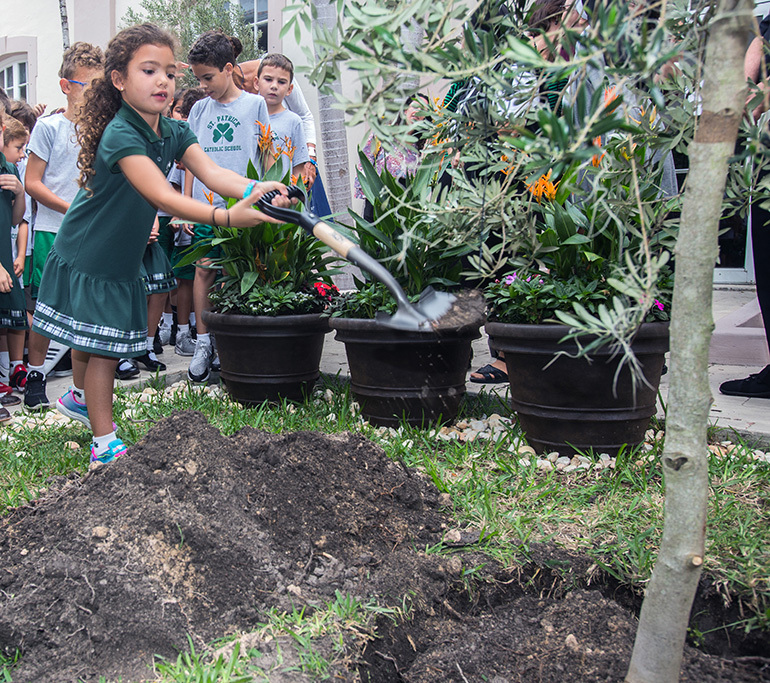 St. Patrick School first-grader Alessia Torres, 6, takes a turn shoveling dirt into the hole where the olive tree was planted Nov. 15. MIAMI BEACH | Father Roberto Cid, pastor of St. Patrick Church, and Rabbi Yitzi Zweig, of Talmudic University on Miami Beach, are good neighbors. Rabbi Yitzi Zweig, left, of Talmudic University and St. Patrick's pastor, Father Roberto Cid, chat at the end of the ceremony Nov. 15. St. Patrick School officials plant an olive tree in the school yard as a sign of friendship between Christians and Jews. 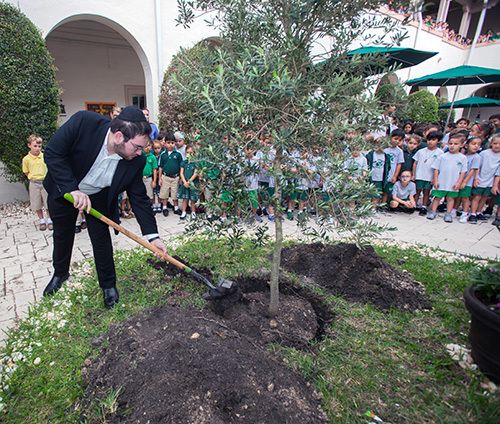 Talmudic University rabbinical school students takes a turn at planting the olive tree, Nov. 15 at St. Patrick School. As an example, Rabbi Zweig lets St. Patrick use the university’s parking lot when there aren’t enough parking spaces for Easter and Christmas Masses. He has invited Father Cid to sample matzo bread and wine from Israel at Passover. “I teach the rabbi Spanish and he teaches me Hebrew. We are both chaplains for the Miami Beach Fire Department. On Palm Sunday, I carried an olive branch that Rabbi Zweig gave me. I’m very proud of our partnership together,” Father Cid said. As a longer-lasting symbol of their friendship, Father Cid decided to plant olive trees in St. Patrick School’s two courtyards. 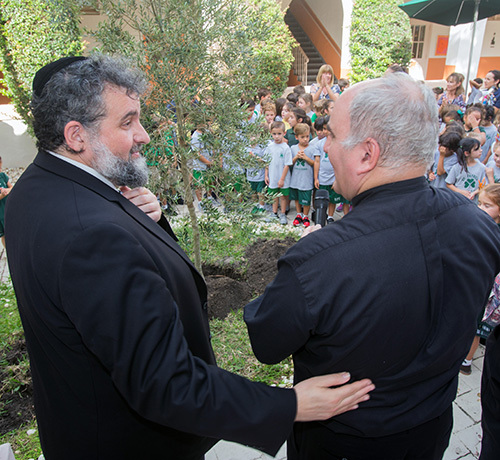 Father Cid and Rabbi Zweig dedicated the first of the two trees Nov. 15, during a brief ceremony with St. Patrick School students and staff as well as some students from the rabbinical college. The dedication coincided with the 100th anniversary of the end of World War I (November 11) and the 80th anniversary of Kristallnacht in Germany (November 9-10), when Jews and their property were attacked and broken glass littered the streets. During the ceremony, Rabbi Zweig addressed the significance of the olive tree. “Who knows why the olive tree is a symbol of peace?” asked Rabbi Zweig. St. Patrick sixth-grader Amelie Capote, 11, answered from the second story school balcony, where some of the students watched the ceremony along with those in the courtyard. Father Cid said that he was following the example of Pope Francis. In 2014, the pope, the Israeli president, Shimon Peres, Palestinian president Mahmoud Abbas and Ecumenical Patriarch Bartholomew I planted an olive tree in the Vatican Gardens as a symbol of friendship between Christians and Jews. Israel’s national emblem contains a menorah in its center, with olive branches on both sides and “Israel” written in Hebrew at the bottom. Miami Turf landscaping donated the cost of transporting the 12-foot Olea Europaea tree from a Clermont, Florida nursery. Eventually, Father Cid will plant another olive tree in the school’s butterfly courtyard, where there’s a statue of the Virgin Mary. School staff members are raising money for a statue of St. Francis of Assisi in the courtyard where the first olive tree was planted. 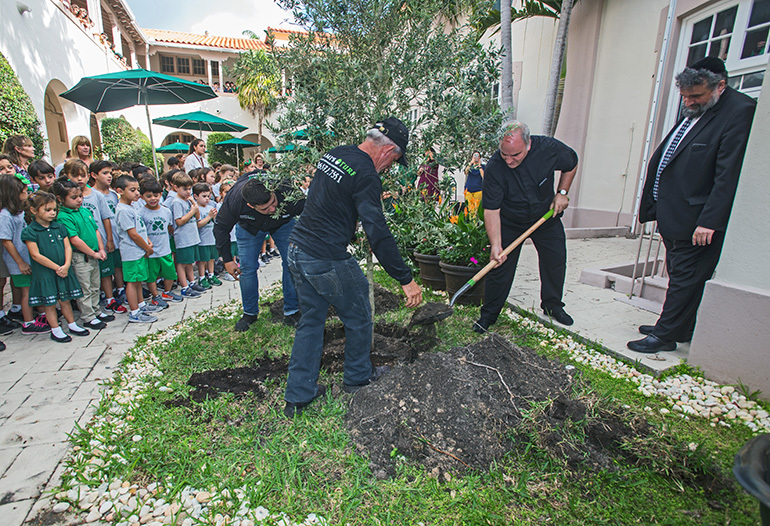 Father Roberto Cid shovels dirt into the ground containing the olive tree as Rabbi Yitzi Zweig and school students look on.